Here’s the deal. One day, we’d like to open our own restaurant. When that happens, I’d like to make just about everything from scratch. Running a restaurant currently, I completely realize how unrealistic that is, but nonetheless I want to try. When I make something that I think might fit into that ‘future restaurant product’ category I tuck it away into a file. Like, an old school file in a filing cabinet… not a newfangled file on my computer. This just might be a recipe that makes it into that file. You see, one night a few weeks ago we were having hamburgers for dinner. I forgot to buy buns. Being me, I decided that instead of piling children back into the car, I would just make buns. Thus began my search. 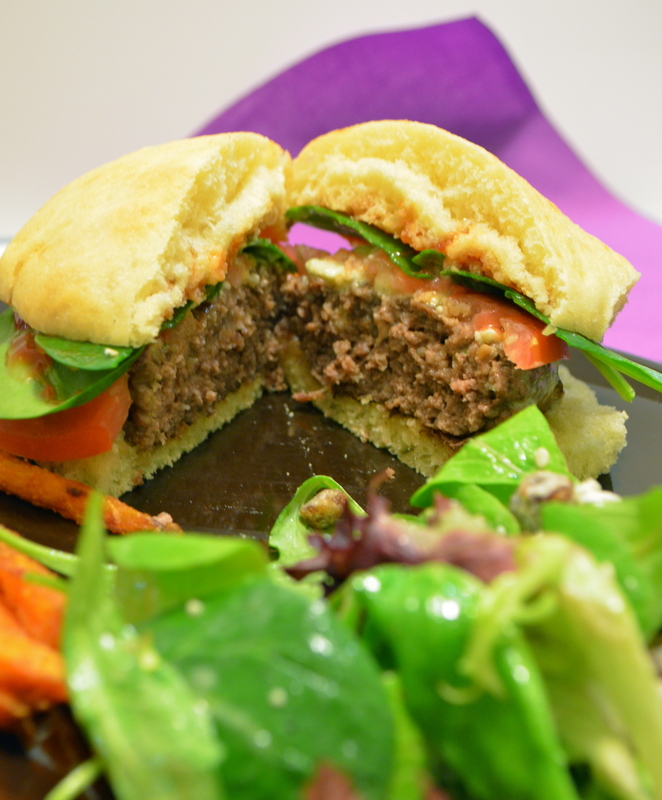 This Light Brioche Burger Bun recipe popped up on my Google search from Smitten Kitchen. If Deb thinks it’s good, then it must be good. Thus concluded my search. I like searches that like. You try one recipe and BAM, that’s it. These buns are, in a word, delicious. I don’t really have another word. I ate two by themselves before even putting a hamburger patty on one. They would be perfect for sandwiches or as dinner bread. Like a classic brioche, they aren’t super moist or dense, but just enough so that they don’t crumble under the pressure of housing juicy ground beef. This is one of those awesome recipes that requires you to remove your rings and get your hands dirty. I love recipes like that. The best utensils reside at the ends of our arms. Next time, I’ll add sesame seeds and a little more egg wash. On a side note, they freeze really well. HUGE PLUS! In a glass bowl, mix water, milk, yeast and sugar. Stir just a bit, but then let it sit for about 5 minutes… until it’s foamy. In a small bowl, beat one egg. In a large bowl, beat flours together with the salt. Work the butter into the flour with your fingers, making fine crumbs (see photo above). 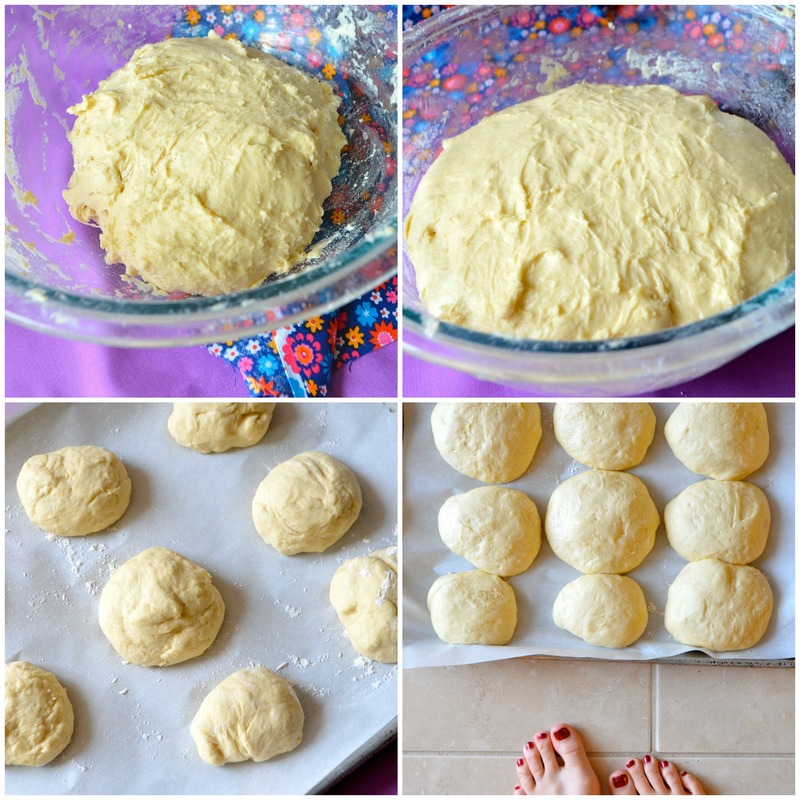 Using a dough scraper, mix in yeast mixture and egg until a sticky dough forms. Turn dough out onto a well floured surface and knead 8-10 minutes (until smooth and elastic) picking it up and slapping it onto the counter every minute or so. The dough will still be a little sticky… and remember that the more flour you add, the tougher the buns will be. Return dough to the bowl, loosely cover and let rest in a warm place for one to two hours… until doubled in size. 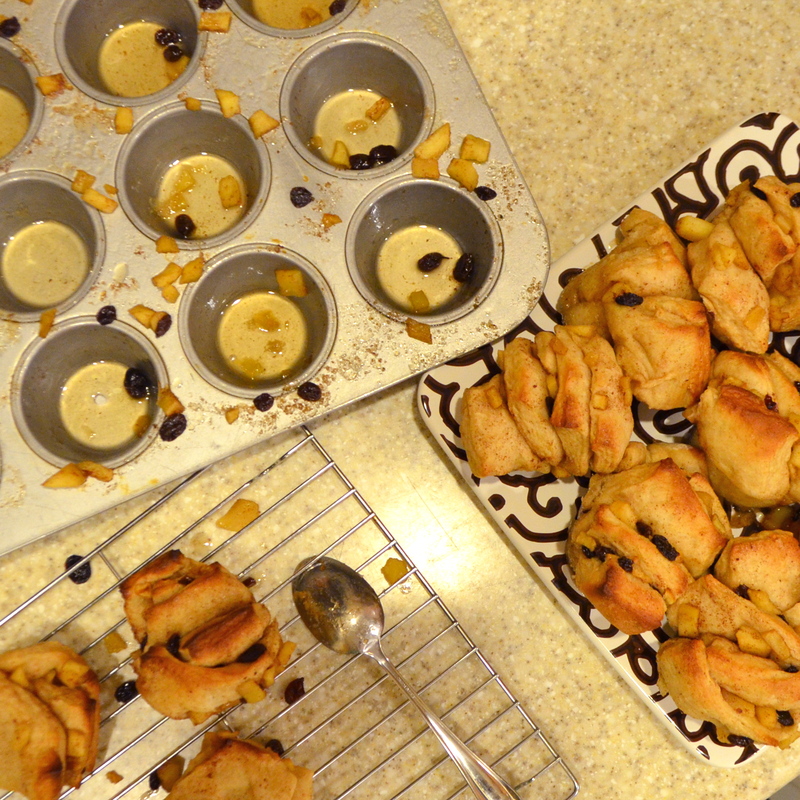 Then, divide dough into 8 equal parts and gently roll into balls. Place on a parchment lined baking sheet and let rise again, covered and in a warm place, for another hour or so… again until doubled. Two notes: 1. 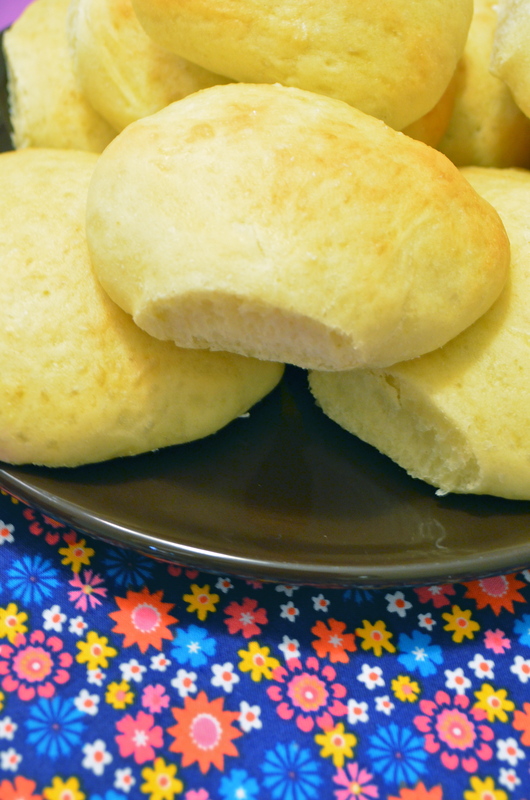 I have 9 rolls, because I split one in two to make smaller buns for Bug; 2. I usually cover rising dough with a kitchen towel, but plastic wrap sprayed with cooking spray works fine, too. Place a shallow pan with water in the bottom of the oven and preheat to 400′. Beat the remaining egg with a tablespoon of warm water and gently wash over buns. Sprinkle sesame seeds, if using. Bake at 400′ for about 15 minutes, or until tops are golden brown. Transfer to a rack to cool completely. Like a lot of moms, I love the idea of feeding my children preservative free, healthy foods all the time. The key word there is idea. Convenience often trumps that desire. One of Bug’s (and mine!) favorite snack is a granola bar… “granilla bar” if you ask him. We have a shelf in our pantry that has been deemed the ‘snack shelf’ and it is stocked with store bought granola bars, raisins and Craisins. We do at least try to buy the ‘healthier’ of the granola bars available (my new favorites are Quaker Real Medleys), but there still has to be not-so-good stuff going into them just to preserve their shelf life. 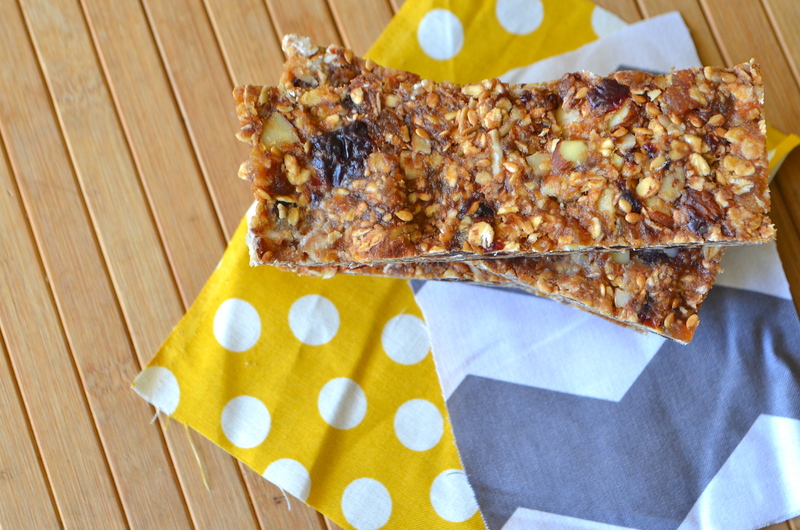 So, I sought out an easy-to-make, homemade granola bar recipe. 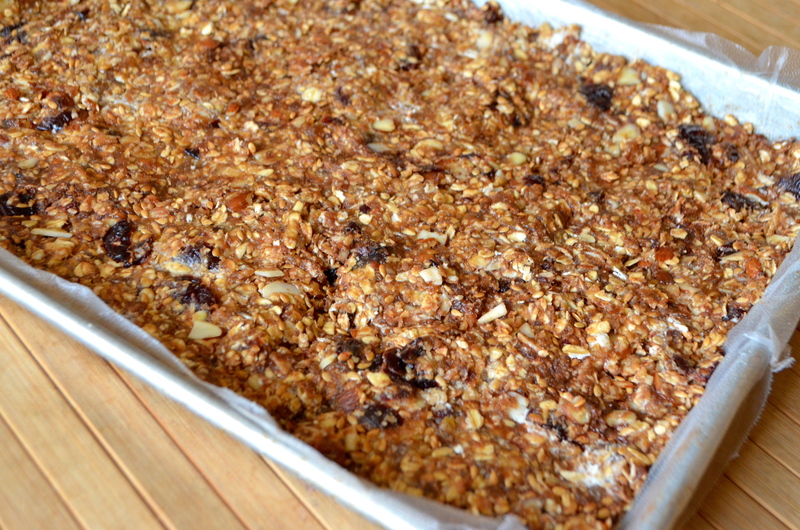 Turns out, you don’t really need a recipe for granola bars. You just need a combination of oats, fruits, nuts, seeds and something sticky and slightly sweet to make it gel together. I used the base recipe from the Minimalist Baker, and then added whatever I thought looked yummy. And yummy they were! 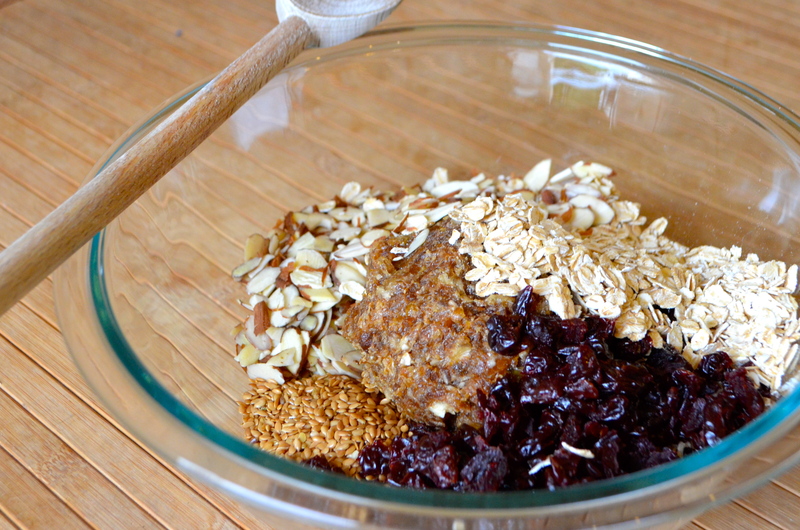 Keep in mind that making granola bars is not necessarily something that will save you money. But it is something that you can feel really good about feeding your kids… and yourself. This is totally optional, but I toasted the oats and flax seeds on 350′ for about 10 minutes. 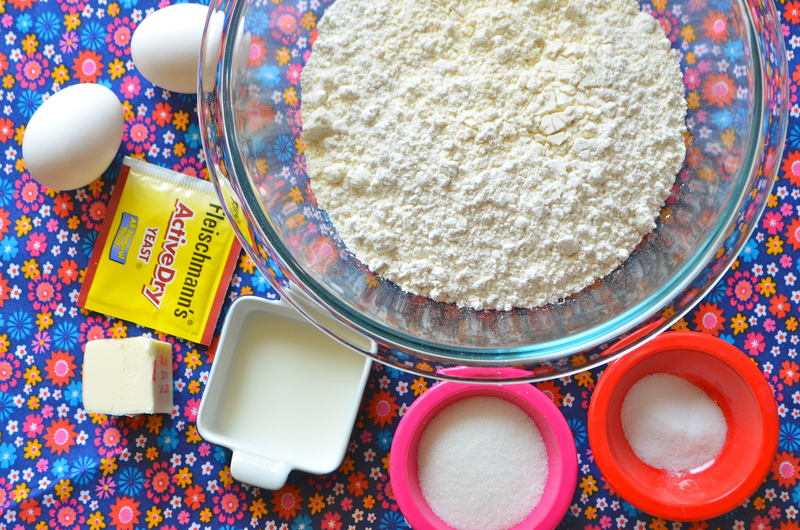 Throw the dates in a food processor and process until it forms a dough like consistency. Mine turned into a ball. 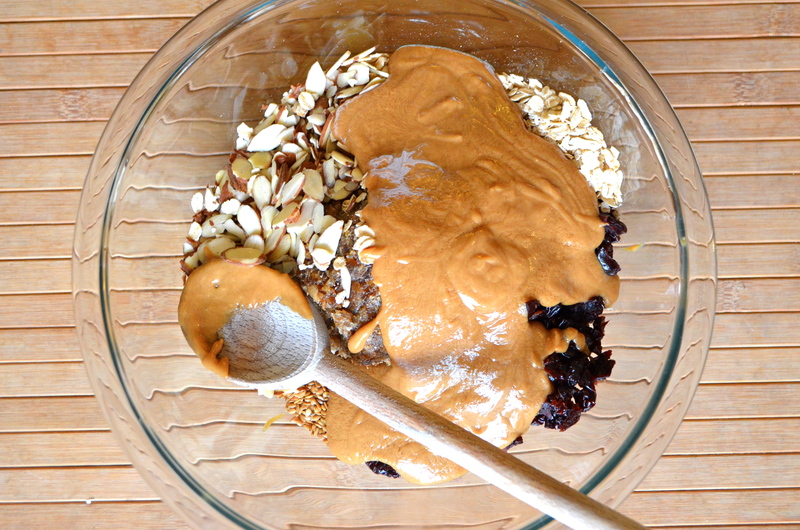 Put everything except for the peanut butter and honey into a large mixing bowl. In a small saucepan on low heat, stir together peanut butter and honey until it is warm and melty. Add peanut butter mixture to the dry ingredients and mix it all together. You could use a spoon, but I totally used my (very clean) hands. Line an 8×8 or other small pan with plastic wrap or parchment paper. Put granola mixture in pan and press down firmly until uniformly flattened. Cover with plastic wrap, put in the fridge for 20 minutes. Cut into desired size bars and voila! 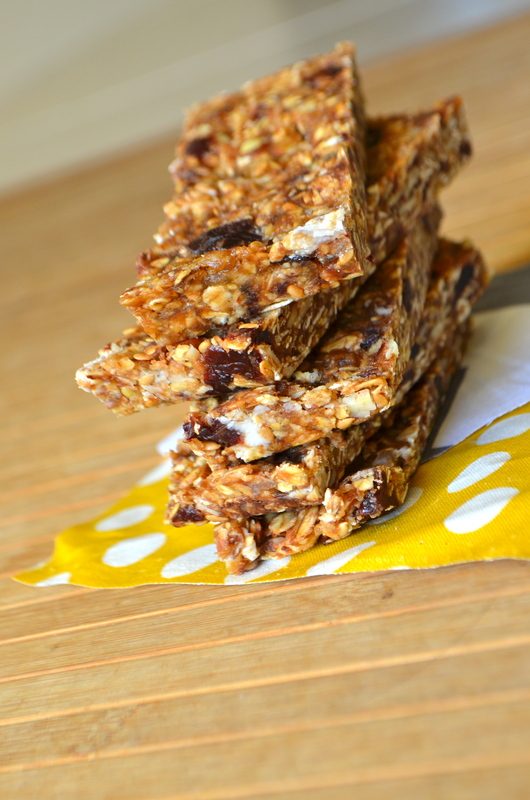 You have super delicious granola bars! These will keep for a few days in an airtight container on your counter, or for up to a week in the fridge. They will keep for a few months if you freeze them. We froze ours and actually ate them right out of the freezer. We thought they tasted better that way! They only needed to thaw for a few minutes. So, here’s the thing. I like Fall. But, I don’t love Fall. I love Spring. I just feel like I needed to throw that out there. 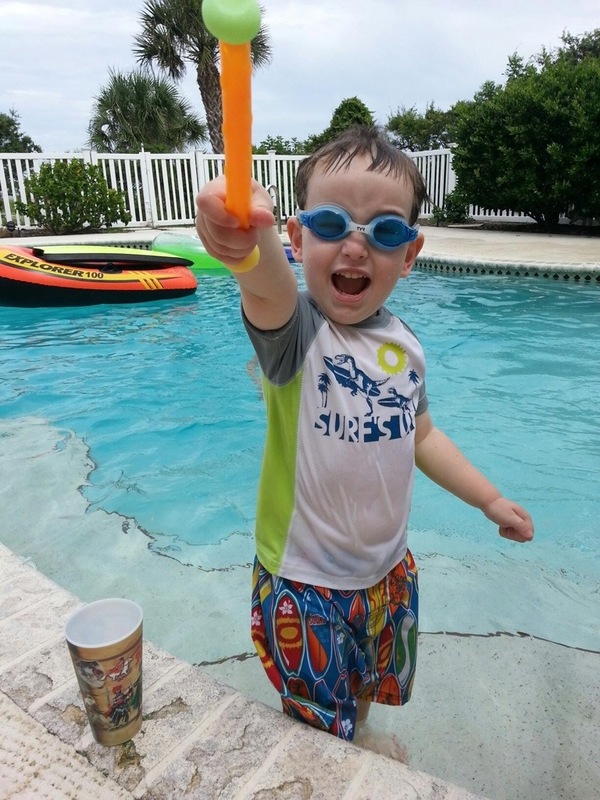 I enjoy the cooler weather and all, but let’s face it… it’s just not that much cooler in southwest Florida. It was like 87 degrees the day I made these fantans. In November. Of course, since I’m saying that, the low tomorrow is supposed to be 40 and the high on Thanksgiving is like 65. It will be the coldest Thanksgiving we’ve had in maybe 10 years. Don’t worry, we’ll still go to the beach and play bocce ball. Because that’s just what we do in Florida on holidays. The one thing I actually do love about Fall is the seasonal baking. In all reality, you can bake with apples and pumpkin (albeit canned, but who purees their own fresh pumpkin for pumpkin pie these days?) all year. I’m assuming that up north, where the seasons actually change, warm apples and pumpkin deliciousness make everybody feel a little warmer. Here, it’s partly an excuse to make it feel like the season has changed… and mostly to get us more in the mood for something completely awesome: Thanksgiving and Christmas! Which, to me, means time with awesome family! Bah! All of a sudden SO excited for Thanksgiving! Okay, to the task at hand. My contribution for Turkey Day is always these Pumpkin Whoopie Pies, which are dessert for the Thanksgiving Eve festivities (yes, we have those at our house and they usually involve deep frying anything we can get our hands on, including whoopie pies) and then usually breakfast for T-Day morning. This year, I’m adding these amaze-balls Caramel Apple Fantans. They take a while to make, but each step in the process is relatively easy, and the end result is worth.it. Promise. 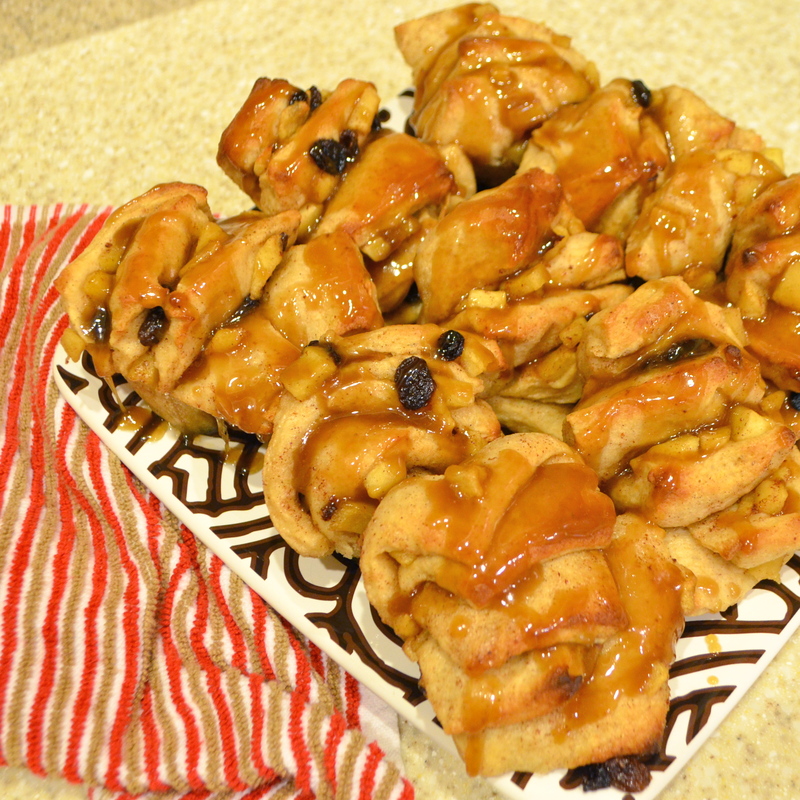 They are pull apart, sticky, sugary, apply delicious. If you don’t have time for Thanksgiving, they would be great for Christmas, too! And, AND, you can make them ahead of time (sans caramel). They freeze really well… just make the caramel right before you serve ’em. Please excuse the lighting in the photos… I made these at night, because that’s when I have time to bake with a newborn. To prepare your dough, combine yeast, water and the teaspoon of sugar in the bowl of a stand mixer and let sit for about 5 minutes. Using the paddle attachment, stir in egg, the 1/4 cup sugar, butter, salt and 1 1/2 cups bread flour. Beat on medium for about a minute or so. Gradually add in the whole wheat flour and enough of the remaining bread flour to make a soft dough. Turn the dough out on a bread-floured surface and knead until smooth and elastic… somewhere between 5-10 minutes… sprinkling with bread flour as needed. Put dough ball into a lightly grease bowl and turn once to grease all sides. Cover loosely with plastic and let rise in a warm place for 45-55 minutes, until doubled in size. While the dough is rising, prepare the filling. In a large skillet on medium-high, melt 1 tablespoon of the butter. 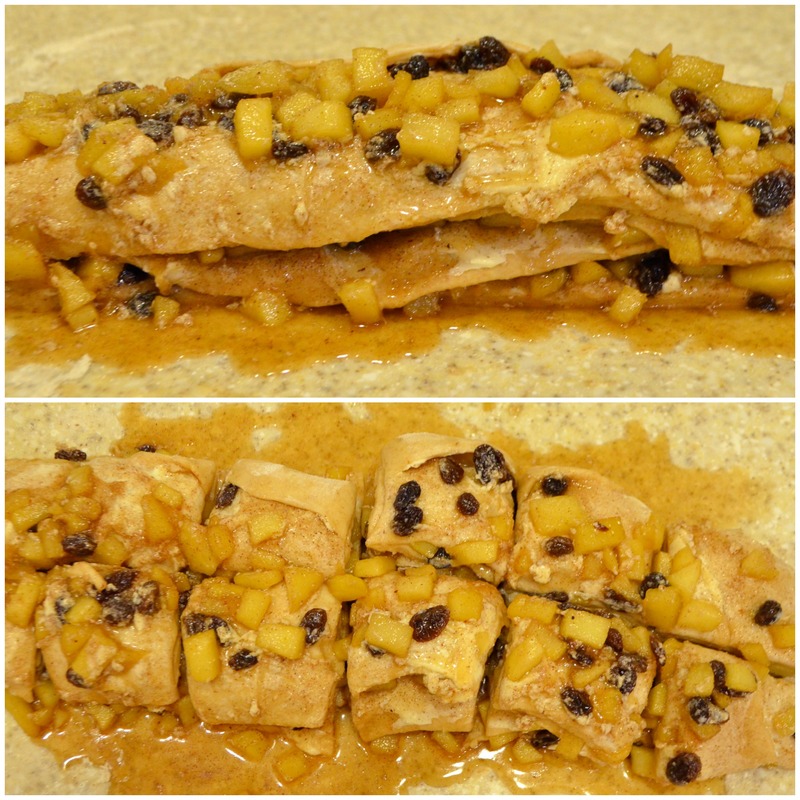 Add apples, raisins and brown sugar. Saute about 5 minutes, until the apples are tender but still slightly crisp. Remove from heat and let cool completely… at least 30 minutes. Punch your dough down and turn back out onto floured surface. Roll to a 20″ x 12″ rectangle. Spread remaining 8 tablespoons of butter evenly onto surface. Mix together 3/4 cup sugar and cinnamon and sprinkle/spread over butter. Spread apple mixture onto surface. 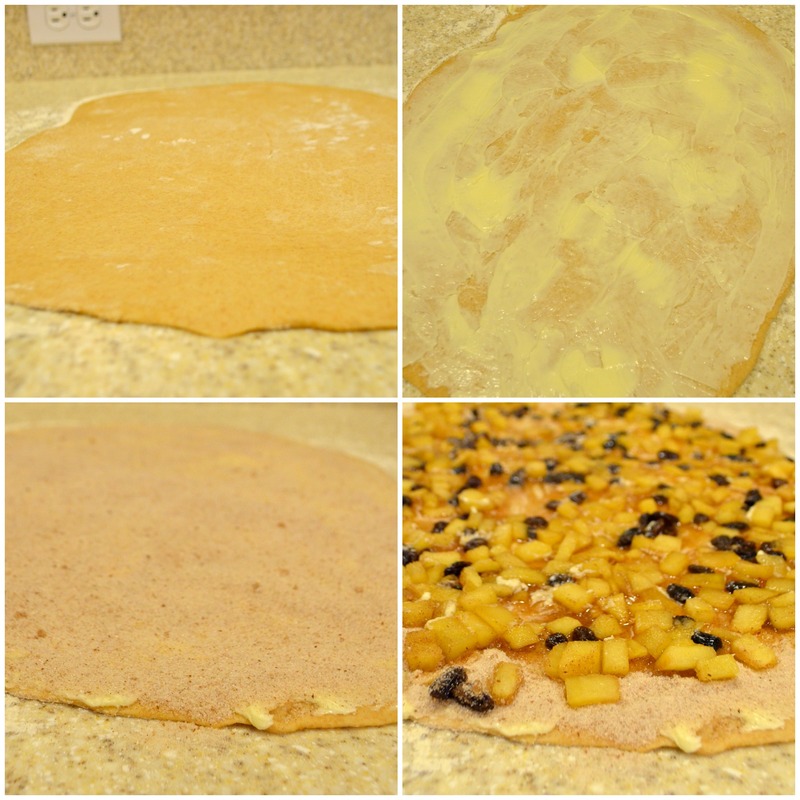 Pay attention here: Cut dough into 5 (12″ x 4″) strips and stack, replacing any apple mixture back onto the dough. Then, cut into 6 (4″ x 2″) rectangles. THEN, cut those rectangles in half so that you have 12 (2″ x 2″) squares. Stuff each set of squares sideways into cups of a greased muffin pan (cut sides up). Cover loosely with plastic and let rise about 45 minutes – 1 hour, until dough has risen 3/4″ above pan. Preheat oven to 375 and bake 18-20 minutes, until deep golden brown. Cool in the pan on a wire rack. You’re supposed to remove the fantans after 5 minutes and let cool completely on a wire rack, but mine started falling apart, so I let them completely cool on a plate. For the glaze, bring butter and brown sugar to boil in a saucepan over medium heat, stirring constantly. Boil for 1 minute, remove from heat and drizzle over rolls. As I said before, the pre-glazed rolls freeze well. The post-glazed rolls refrigerate well, also! Enjoy! The whole time I was pregnant with baby girl, Bug was very sweet to my tummy. He gave lots of unsolicited hugs and kisses to his baby sister and often just laid his hand on my belly while we were watching movies or reading books. He talked to her and sang songs to her. You know, things that make pregnant Momma’s tear up. I am thankful that our second child came when our first was old enough to understand (very basically, of course) the concept of a small baby growing in my stomach and then joining our family. It was a great help to him that I babysat for Baby Emma for a year… from the time she was 3 months old until just a couple of weeks before Cora was born. Bug got to see Emma go from a very small, fragile baby to a baby that stuck everything in her mouth to a toddler walking around and getting into everything she could. He was watchful and protective of her. We were able to use Emma as a teaching mechanism so that when Cora was born, he understood that she would be very small and wouldn’t be able to play much, but as she grew she would be a lot more fun. When we were in the hospital and Bug was in quarantine, we Facetimed with my In-laws so that he could see her for the first time. As soon as he laid eyes on her, his little face (the one that doesn’t look so little to me anymore!) got so soft. The sweetest smile appeared on his face and he said, “Awwww!” He instantly fell in love, just as Hubby & I did with the first glimpses of our children. Bug’s reaction to Cora when he saw her in person for the first time was just as heartwarming to this Momma as their video introduction. His face lit up and he was quiet and again said, “Awwww!” He sat up on the couch with us and touched her ever so gently everywhere that we would let him. And then, we mentioned that Cora got him a gift (Ninja Turtle Legos!!) and he was off. Because he’s 3. Attention span = short. 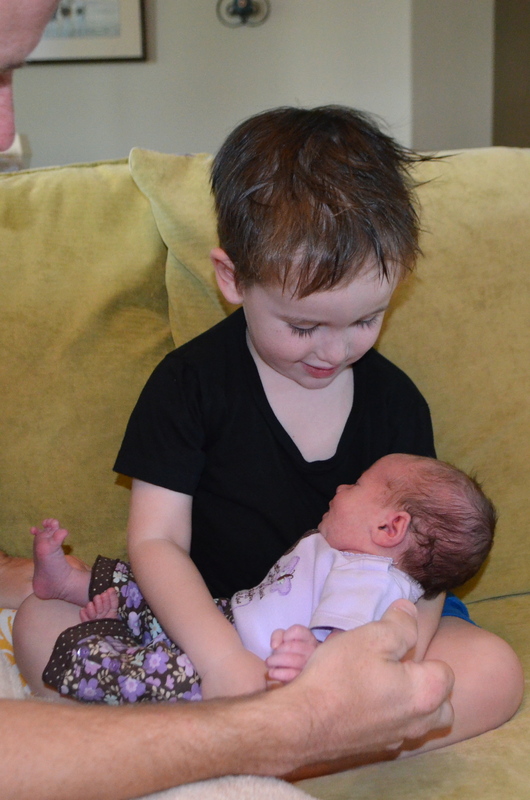 Bug’s love and affection for his baby sister hasn’t waned (yet). Over the last week, he has been so incredibly sweet to her. He doesn’t get frustrated when she cries, or even that we stop playing to tend to her when she needs something. He loves “playing” with her when she’s awake. He pretty much always wants to be aware of where she is and what she is doing. Of course, we have to watch him like a hawk… he is a boy after all, bounding around with little awareness and walking with his head turned all the dang time. 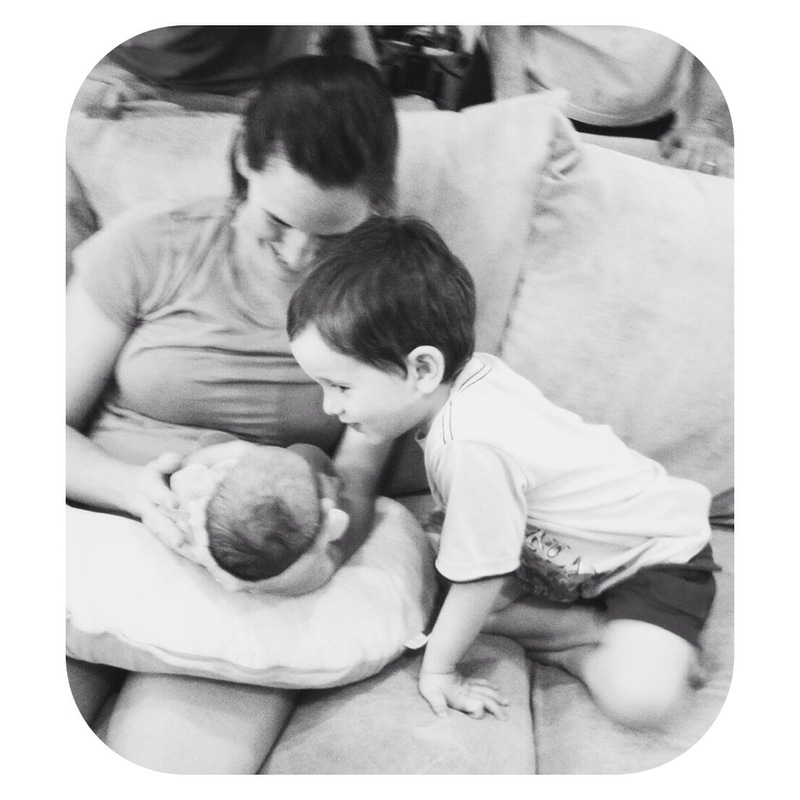 We are so proud of our little man for already being such a fantastic big brother. He even brags about her at school. The other day, he was telling his school friends about Cora at lunchtime and he told them all that Cora drinks milk out of his Mommy’s belly. Hehehe. So glad his teacher shared that story! I mentioned in Cora’s Birth Story that Bug had bronchitis when his little sister was born. This was sad for us… not only because our little guy was sick, but also because it meant that he couldn’t come to the hospital to meet her. 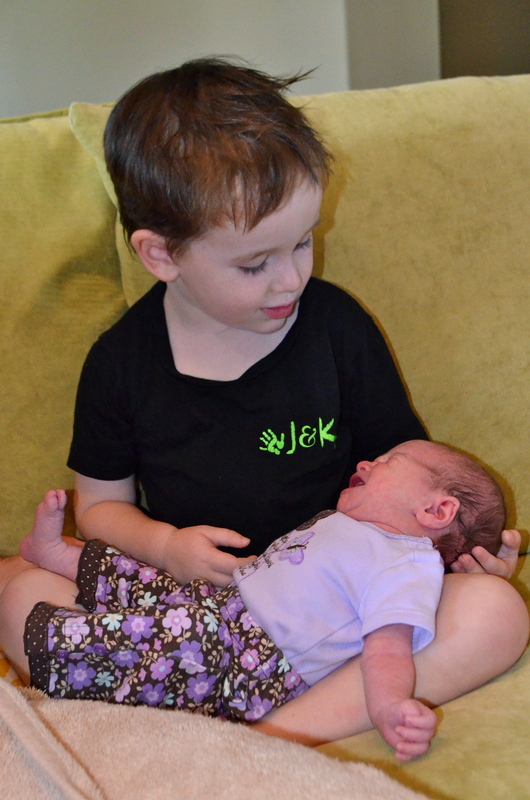 He didn’t get to meet her until she was already 3 days old. Not having your whole family together is tough on a new Momma. You know, hormones and all. I might have shed a few tears because I missed my big boy so much. I’d call him my little boy, but he would immediately correct me. Now that we have a baby in the house, Bug is taking being a big boy very seriously. Hubby & I feel incredibly lucky to have such a flexible son. Part of this probably has to do with how we’ve raised him, and part is just his personality. Part of it is also the fact that he loves his grandparents so very very much and feels so comfortable around them. One of the main reasons that Hubby & I moved back to our hometown was because we wanted to raise our children near our families. Both sets of our parents live within 25 minutes of us, and I’m not sure how we’d survive without them. From the time Bug was a tiny baby, he’s spent a lot of time with his grandparents. He sees both my In-laws and my parents at least once a week (they help with babysitting while I’m working) and oftentimes more than that. He’s spent nights at both of their houses, both with and without us, on numerous occasion and naps often at both of their houses as well. When my water broke with Cora, we were at my In-laws house. Bug was already in bed, but we knew that he’d be totally fine if he woke up in the morning and we weren’t there. He spent two nights and my In-law’s house and a night at my parent’s house. My mom actually had to talk him into coming home on Tuesday to meet his baby sister… he was having so much fun at Grandma’s house that he didn’t want to leave. She bribed him into the car with snacks. Works every time. By carting Bug between family houses so often over the last few years, not only is he comfortable in those environments, but it has helped make him flexible in just about any environment. This is probably where is easy going personality comes in. We can take him anywhere for the night and stick him on a random couch and as long as he knows it’s his bed for the night, he’s just fine. He even had his first sleepover at a friend’s house a few months ago. Well, it was a sleepover at his Godparents’ house with their kids. As expected, Mr. Flexible did awesome. Pretty sure he didn’t even notice that we weren’t there. Point of this whole post: I’m proud of my Bug for being so flexible. I hope that we can raise his little sister to be the same. Warning: this post has the potential to freak out those who have issues with medical squeamishness. You have been warned. Okay, so before I give you Cora’s actual birth day story, I would like to provide a little back story. You see, my OB had been monitoring my platelets this pregnancy. For the majority of my pregnancy, they weren’t alarmingly low by any means, but low enough to keep an eye on. Your platelets help clot your blood, so you can probably understand why they are important during childbirth. The last two months, mine had been holding steady at 107 (150 is normal), but last week they dipped to 86. Not great news, especially considering that many anesthesiologists won’t give you an epidural when they are below 100. On Friday, October 4th, in the late afternoon, we saw the perinatologist, who gave me steroids to boost my platelets… solely because I wanted an epidural. She wasn’t concerned about them otherwise, because they weren’t scary low. It was to take about 48 hours for the steroids to take full effect. Baby girl was due October 6th, and I was induced a week late with Bug, so I wasn’t super worried about going into labor within those 48 hours. Around 7:30 on Saturday morning (October 5th), I woke up to a mild crampy contraction, not unlike those that I’d been having for a few nights. Right after that contraction, I felt a gush. Not a large gush, mind you, but a gush nonetheless. Since I had never actually gone into labor with Bug, I thought that my water had broken. So, we packed up, woke up Eli, took him to Nana & Pops’ house and went on our way to the hospital. I was having really mild contractions every 8 minutes or so. The doc on call (Dr. Stephens) checked me, I was only 3-4 cm dilated, but 80% effaced, and it turned out that my bag of waters hadn’t actually broken. Just a bunch of other lovely pregnancy related stuff had dislodged. The doc sent me home, saying he’d probably see us again within 72 hours. I spent most of Saturday in early labor… very manageable contractions, roughly 6-10 minutes apart. Nothing that I couldn’t talk or walk or make brownies with my little man through. Hubby and I spent the day at his parents house with Bug, who sadly is sick this weekend. We watched college football, Hubby & Pops played 18 holes of golf, we napped, we ate brownies. It was actually a really nice day. I started to have more severe contractions around probably 6:00 that evening. Still about 6-8 minutes apart, but didn’t really care to talk or walk through them. We put Bug to bed and ate dinner and I went to lay down and try to relax. Contractions continued to get stronger and closer together. At this point, we were really just waiting for the 5-1-1 sign. Contractions 5 minutes apart, 1 minute long for at least an hour. At 10:15, I had a really strong contraction and immediately after my water broke. Like, for reals this time. No mistaking it. Hubby said he heard it pop. So, again, we packed up and headed for the hospital. On the 30 or so minute drive to the hospital, contractions were impossible to talk through and about 3 minutes apart. Thank God it was late enough at night (in our retiree city) that there wasn’t much traffic. Also, thank God we had a towel in the car. We checked into Labor & Delivery just after 11:00. Yeah second time going to the hospital in one day. When you check into L&D at our hospital, they take you into triage to make sure that a) your water really did break and b) you are really in labor. The charge nurse walked me into triage, saw a gush of fluid go down my leg and walked me right back out. I was hooked up to fetal monitors and had IV fluids by 11:15 or so, at which point the nurse checked me and I was only 4-5 cm dilated and still about 80% effaced. Read: not a lot of progress from the morning. They took my blood to check my platelets to see if by chance they had gone up enough to get an epidural. Contractions were becoming pretty unbearable at this point. I could still breathe through them, but only with much needed coaching from Hubby. So the nurse checked me again. At 11:40, I was 5-6 cm dilated. The nurse said she could pretty much feel my cervix melt away, so she decided to call the on-call doctor (Dr. Stephens) just in case. The next 15 minutes were agony. There was a lot of screaming on my part, and I’m pretty sure I asked (or yelled, whatever) for help more than once. You know how labor looks in the movies? That was me. My amazing, incredible nurses and my calm, incredibly supportive husband were life savers in trying to keep me focused. It was somewhere in there that I realized there would be no epidural. I asked and my nurse was like, “No, the baby is coming.” At about 11:55, I told them I needed to push. They called the hospitalist (the OB employed by the hospital to be there 24/7 just in case your doctor doesn’t get there in time). He got there just in time to catch baby girl. I think I pushed 4 times. It took like 8 minutes. She was born at 12:04 am on her due date. Punctual little thing. Dr. Stephens missed it by like 2 minutes. He did get there in time to do my stitches, though! 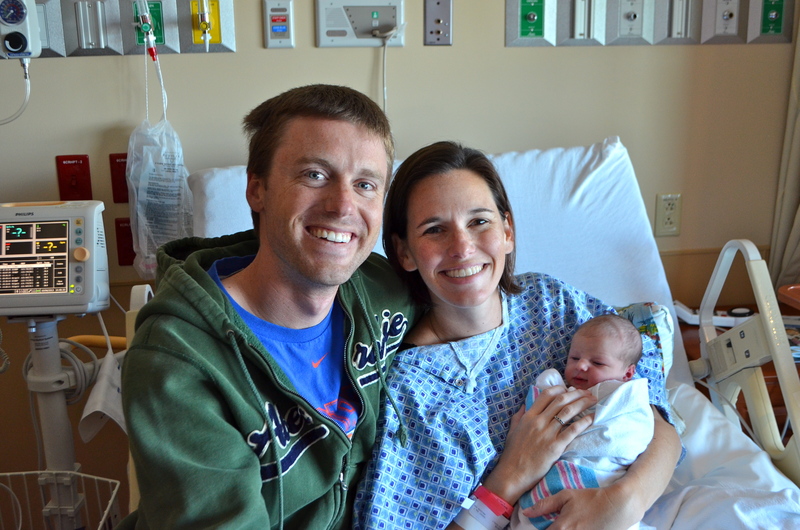 So, let’s recap here: We went from my water breaking to having a baby in less than 2 hours. I went from 5-6cm dilated to having a baby in less than 30 minutes. With no drugs. Crazy. Town. There never was time to send my blood off before delivery. They sent it off afterwards and my platelets were 137k. Soooo, the steroids worked, but the irony is it didn’t matter even a little bit. In the end, I am really proud of myself for giving birth without an epidural. Hubby was sure I could do it the whole time, especially when I wasn’t so sure of myself. Our bodies amaze me. I felt so out on control during that final transitional phase of labor… but when I felt her crowning, I began to calm down a little bit. I felt like I could breathe again. I mean, there was still some intense screaming as I physically pushed, but at that point it was mostly a release. I’d also like to note that I feel much better after this birth than I did after Eli. I am less sore, less swollen. I don’t know how much of that is second baby and how much is super-fast birth. 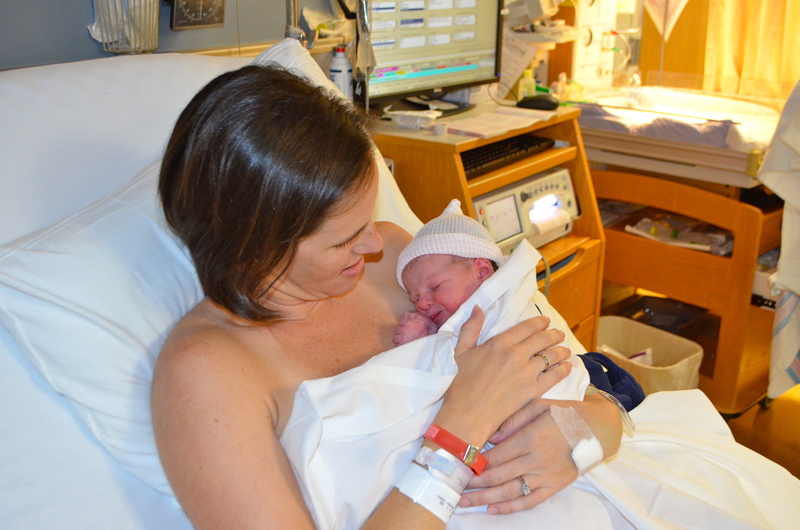 I could walk to the bathroom right after giving birth, with very little pain, which I am pretty sure is all no epidural. Cora is perfect. She’s tiny and petite and beautiful. Because her trip down the birth canal was so quick, her little head is perfectly round and her little face isn’t swollen at all. 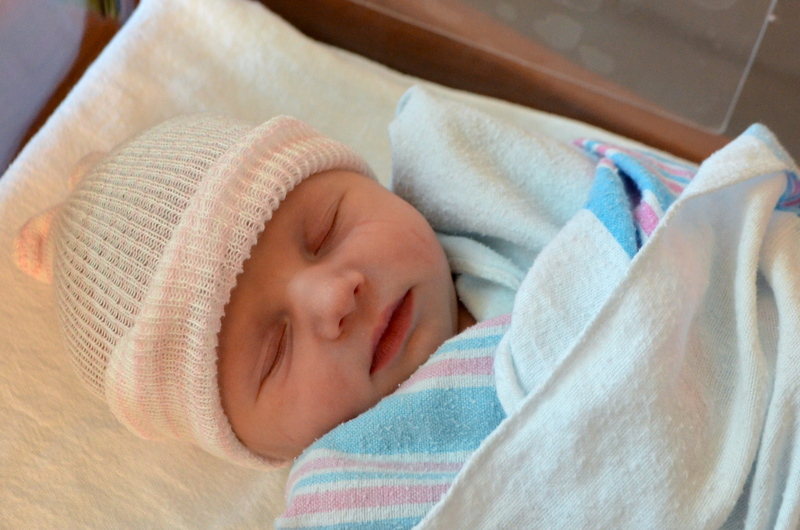 With so much love and blessings, we welcome Cora Hale to the world… Born 10/6/13 at 12:04 am. Weighing in at 6lbs, 7oz and 20.5 inches long. Really sleepy in the car one afternoon: “I’m going to close my eyes and think about myself.” And then, promptly fell asleep. 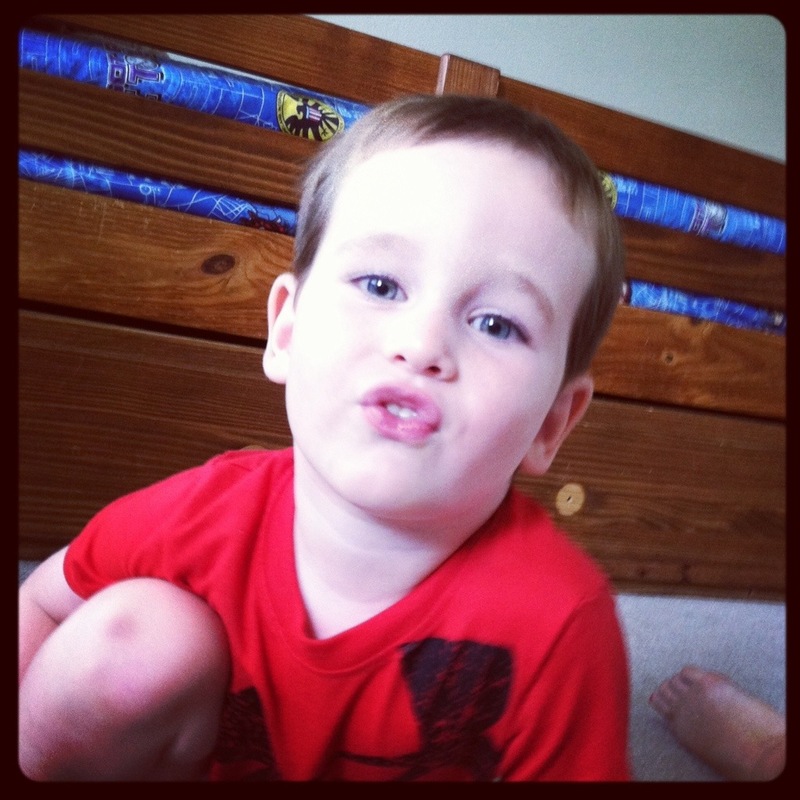 Instead of saying “No, thank you,”… Bug says, “No, please.” We don’t correct him, because it’s cute. 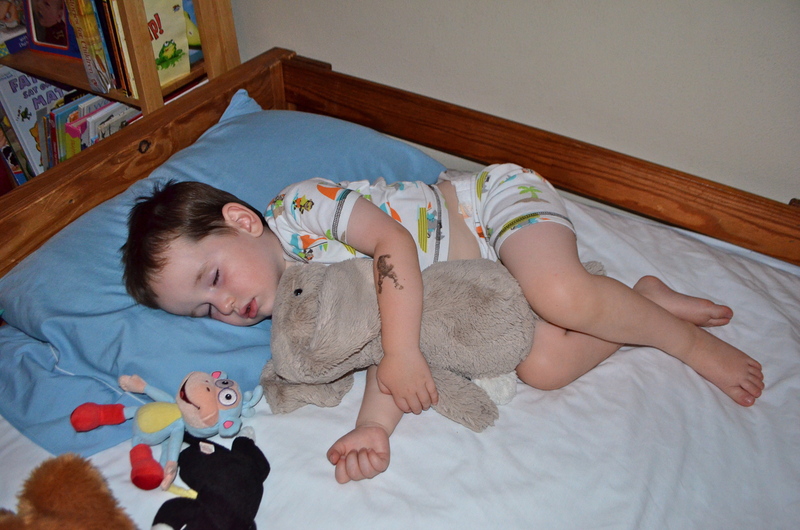 We had one particularly difficult evening where Bug was just tired after a long day at school. He refused to eat his dinner, screaming and crying at me to feed it to him. After telling him that I wasn’t going to feed him because big boys feed themselves, he scooped up some food on his fork, put it on my plate and sassypants said, “I put this here so you could feed me.” One of those moments where I had to look away so I wouldn’t laugh. Bug has been having some very good and resourceful ideas lately. Things like moving his little stool all over the house to be able to reach things that he needs and/or wants. He is finding more and more ways to become independent, which is great with a new sister in the house. Every time he does something like this, or every time he sees us do something that he thinks was a good idea, he says, “I was thinkin'” (or, “You were thinkin'”). Now that it is the holiday season, we’ve been talking a lot about Christmas being Jesus’ birthday and singing a lot of Christmas songs and stuff. The best part of all of this is Bug saying ‘Jesus Price’ instead of Jesus Christ. I haven’t been correcting him because I know he’ll only say it that way for a short time and I’ll probably miss it when it’s gone. Something that I was going to include here, but now technically can’t because, as of last week, it is officially a phrase that Bug used to say: “Sit next by me.” I am seriously missing this one. Damn, they grow up so fast! One of Bug’s favorite places to play right now is the baby’s room. I’d say it’s because he’s getting ready for his sister to arrive or something deeper, but really it’s just because it’s full of toys that he hasn’t played with in a long time. Like this puzzle. As soon as we took the pieces out, he said, “Let’s have a battle!” And so we did. 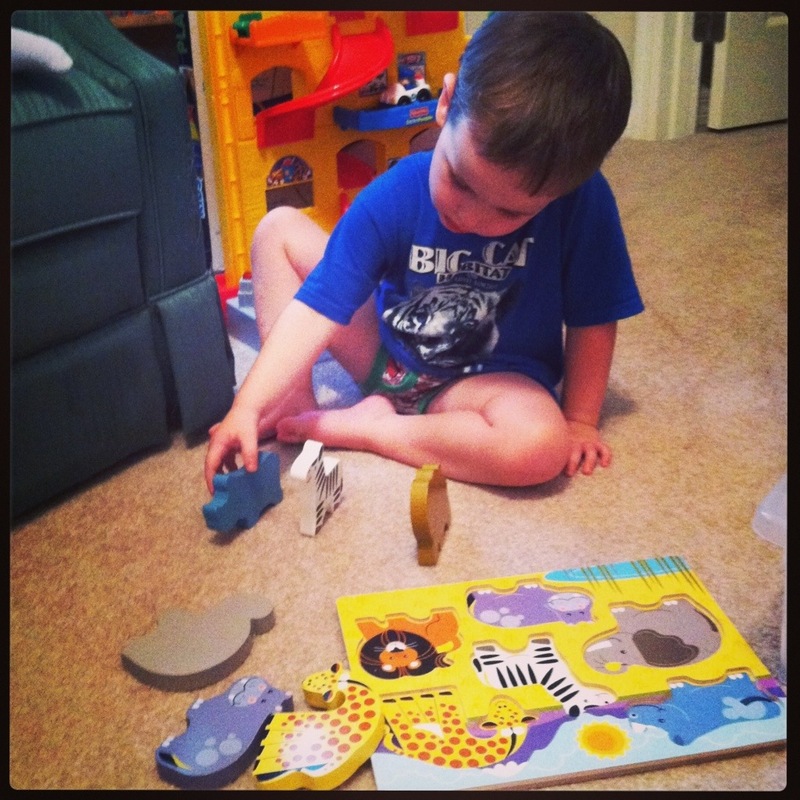 Nobody won, because he decided that the animals became friends. Sweet boy. Love that imagination. Some lobster crackers that I ordered for work a couple of weeks ago came individually wrapped in these little bubble wrap bags, cardboard and zip ties. Awesome for Bug, not awesome for Momma, who spent like 20 minutes unwrapping 50 crackers. 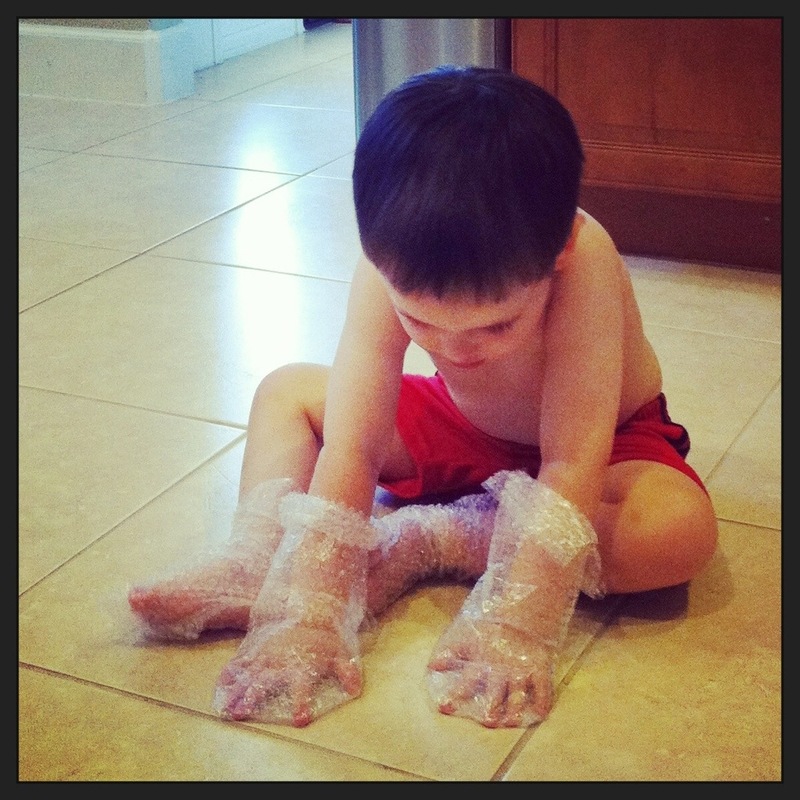 I brought a bunch of the bags home and we experimented with fun ways to pop the bubbles. The fun lasted about 5 minutes before we had popped them all. “Mom, take a picture of this!” He was making some kind of animal sound while he made this face. Alas, that was a whole week ago and I can no longer remember the sound he was making. Because I’m pregnant and spacy. This is Bug’s new friend Noah. Noah’s super awesome parents just moved here on a total leap of faith to be the worship leaders of our church. They moved to a new city & state knowing only a few people… just picked up and moved. They have garnered a lot of respect from me! 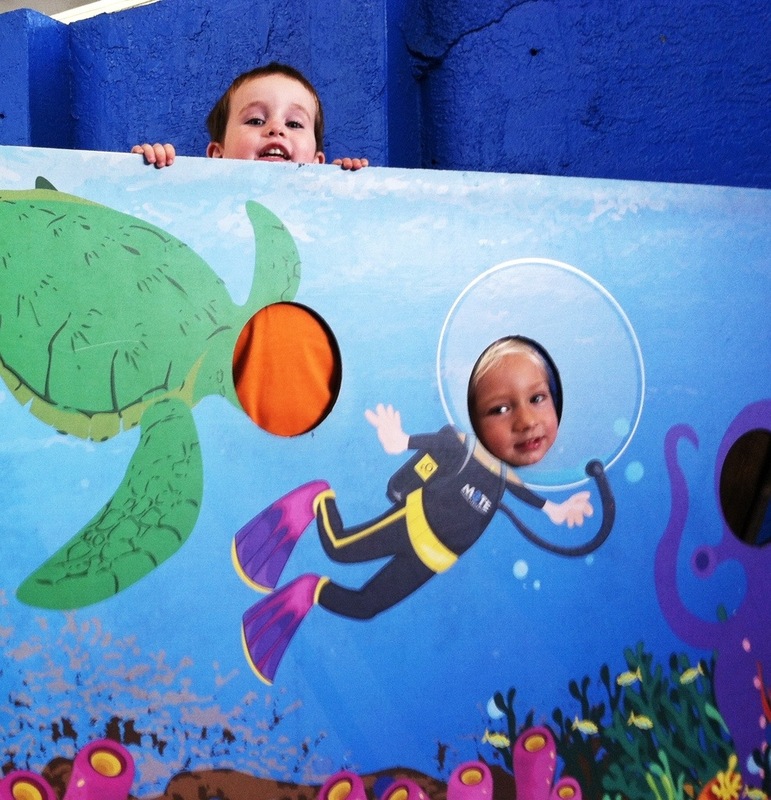 We’ve really enjoyed getting to know them and showing them a little bit about where we live… like Mote Marine! One of our favorite places to spend a morning. The day we visited Mote, we took the boys across the street to have a little picnic lunch. Not a bad spot for a picnic, huh? 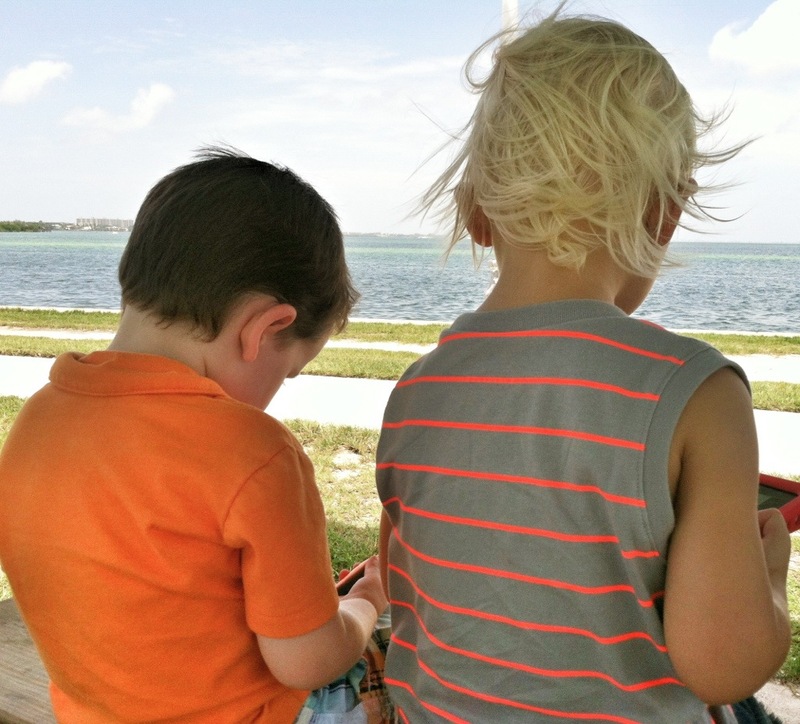 The boys loved watching boats go by! You will notice here that Bug looks quite a bit shorter than Noah. This is true. And, of course, Noah is 3 months younger than Bug. Story of my poor short kid’s life. I realize it doesn’t look like much of an incline, but this is pretty much the biggest hill in Venice. It’s part of the Legacy Trail, which is the amazing bike trail that I run on. This bridge goes over US 41. I used to look at this bridge as a challenge during my run. Now I stop and walk and take pictures. Sometimes, Bug wakes up too early for my liking. Especially after I’ve worked a late night. Hubby goes to work at 7am, and his car often wakes up a small child. If I don’t have to work that morning, or if we don’t have plans of some kind, Bug gets to pick out a movie and climb in bed with me. We both think this is awesome. He’s holding a Tums in that picture that was left over from the night before on my bedside table… I wouldn’t let him eat it, so he just held onto it for like 45 minutes. It was my turn to wait for the hood cleaners at work last week… yay! Once a quarter, guys come to clean the hoods in the kitchen. Instead of leaving work at about 11pm, someone gets to stay with the hood guys until, oh, about 2am. It’s awesome. I decided to make the most out of that time and work on a project. 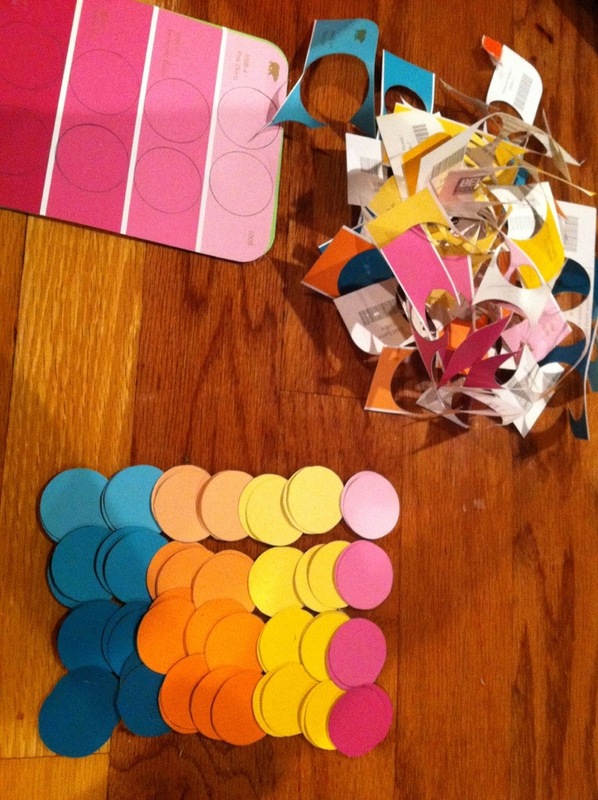 I started making a paint chip mobile for baby girl’s room. It turned out pretty cute… eventually I might even do a little tutorial on it. This is Bug. He was once a baby. He is now a big boy. Just ask him. 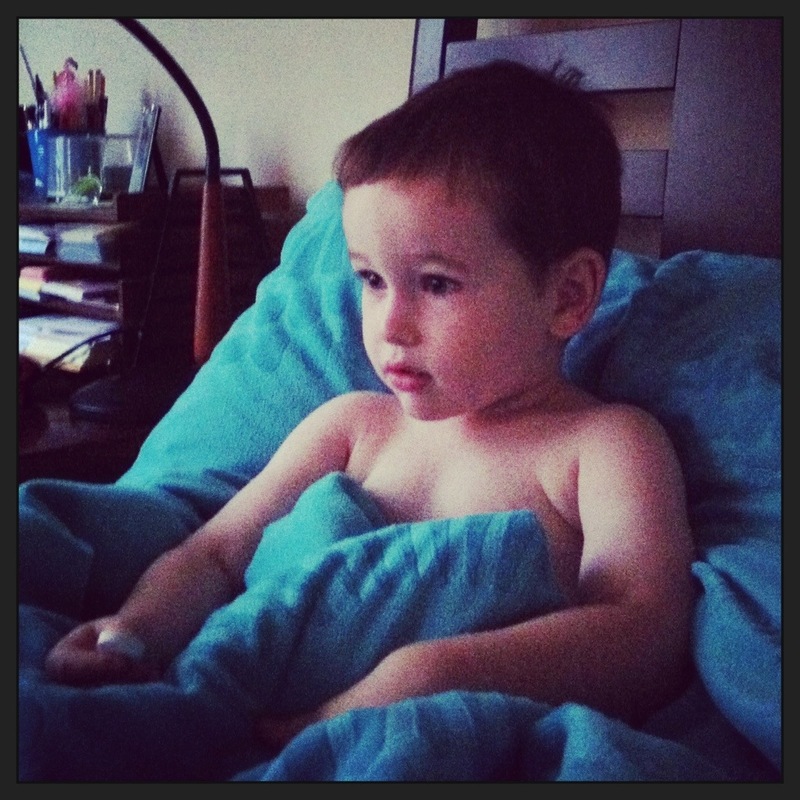 I love looking in on him while he’s sleeping, because he just looks so… so… grown up! Until I realize that his Bud (his lovey blanket) his in his mouth because he fell asleep sucking it. That makes me feel a little better… like he’s not growing up quite so fast. Hi there. We’ve been busy living summer. This here’s a photo dump of what I posted on Instagram for the end of June and most of July. These pictures pretty much sum up our summer thus far. See that freckle faced boy? 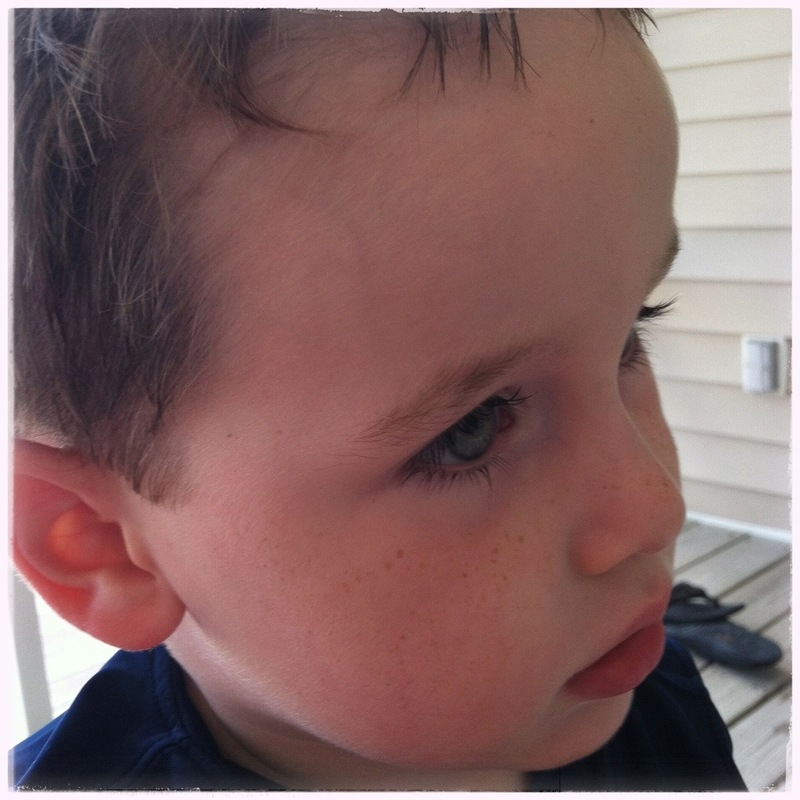 Poor Casper has skin just like his mommy & daddy… fair & freckled. No amount of sun leaves a tan on him. Not that the constant application of 55 spf helps that situation. It does, however, help that whole skin cancer issue. You’re welcome, Bug. I never thought about this when we were naming him, but I am thankful that we chose a short, easy to spell, easy to write name for our son. 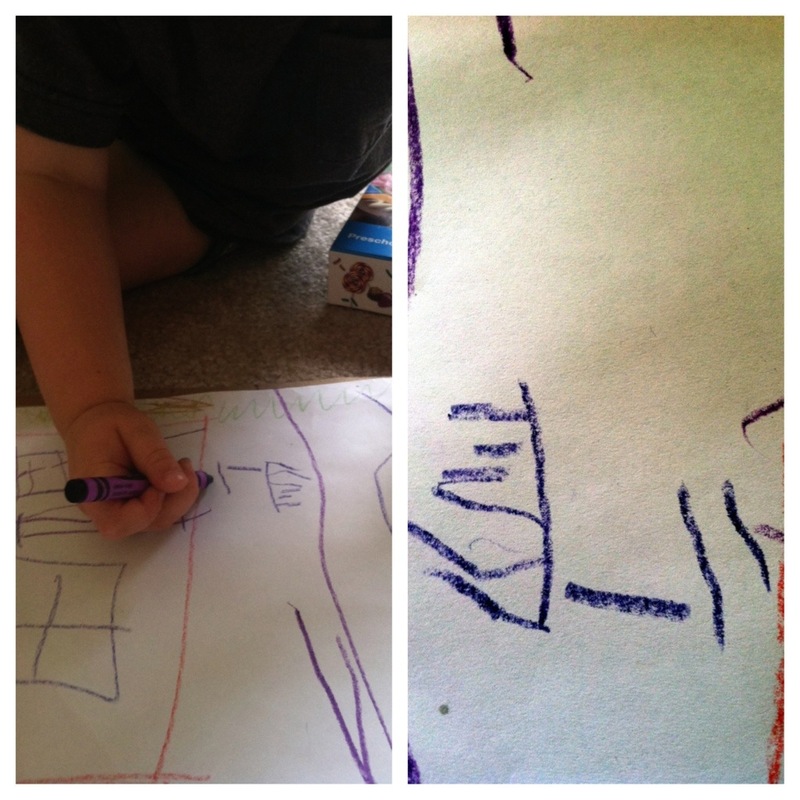 He’s been able to spell Eli for months, and now he’s figuring out how to write it. This was the first time I had him try it (though they may have practiced at school). With the exception of the letters themselves being backwards, I was was really impressed. I manage a full service restaurant. We all know that. We also cater. Catering is kind of my baby at work, and we went from rarely catering (like, maybe once a year) to catering events 6-8 times a year. I love being able to cook something fresh for someone’s wedding or birthday. I also love the challenge of making a beautiful, delicious meal in an unconventional setting… makeshift kitchen, cooking out of coolers, etc. 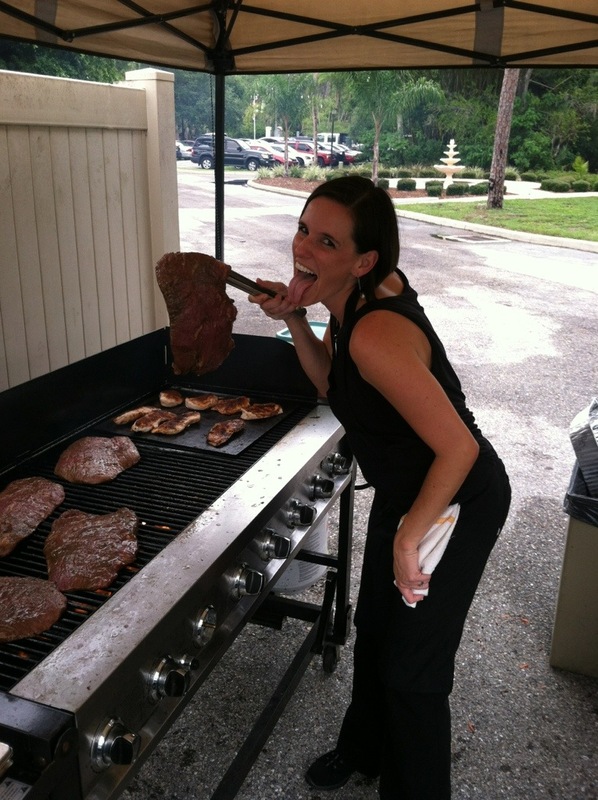 We have yet to cater an event where people weren’t really happy, and that makes all of the stress of the organization and timing totally worth it. This particular wedding was at the same estate where Hubby and I got married, which made it extra special for me. This couple’s first dance was to Jack Johnson’s “Better Together,” which happens to be the same song that Hubby & I shared our first dance to almost 7 years ago. I was very excited about that. Also, the couple had their first date at our restaurant, which I thought was pretty awesome. It sideways torrential downpoured about thirty minutes before that photo was taken. Yay for improvising & for portable sunshades! 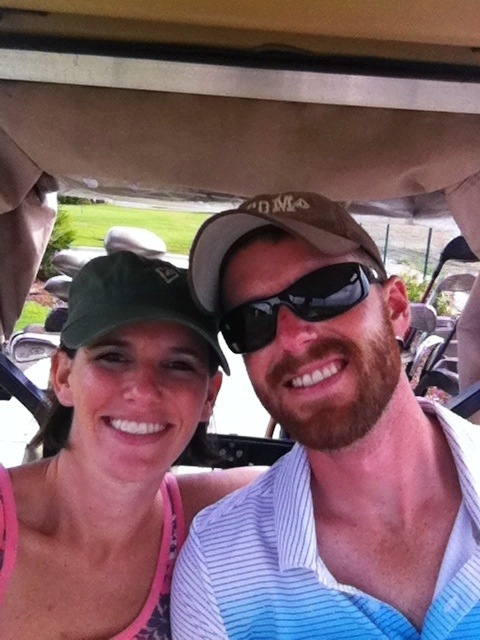 Hubby and I got to go golfing. By ourselves. We laughed a lot. Love that man. Fourth of July to me is celebrating with friends and family on the beach and watching the fireworks go off over the water. This year we were able to share the evening with our new friends from church, some of whom had never experienced the 4th the way we do it in a coastal town. 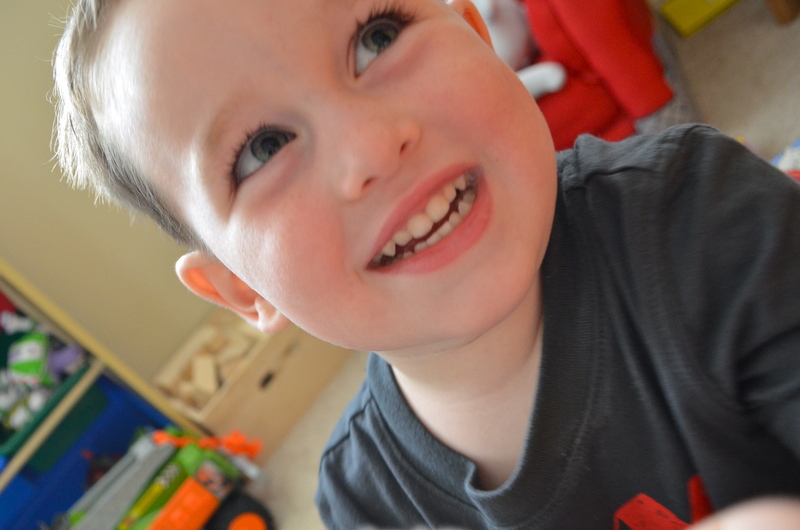 Our little boy got to play with all of his buddies… I was in heaven watching him be so excited and happy. After breakfast one morning, Bug said, “Mommy, let’s snuggle.” Couldn’t say no to that. 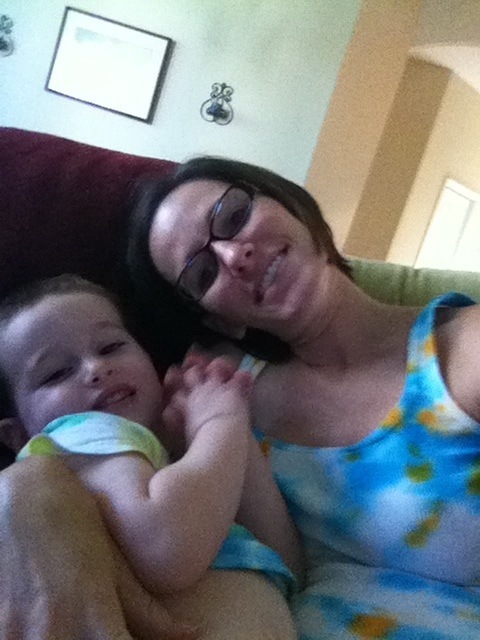 Plus, we were both wearing our tie-dyed shirts that we made together. 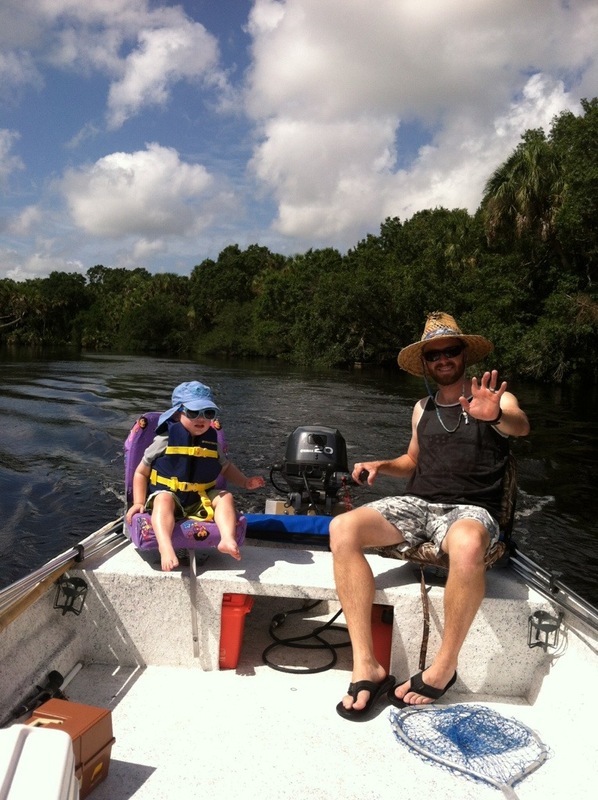 Random boat trip on the Myakka River. We packed a lunch, cruised for a bit and just spent time together. 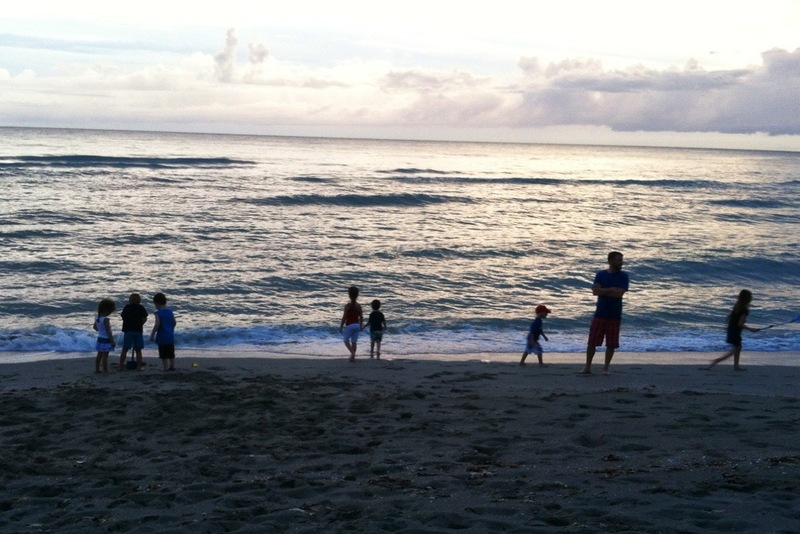 It was a beautiful day with my boys. 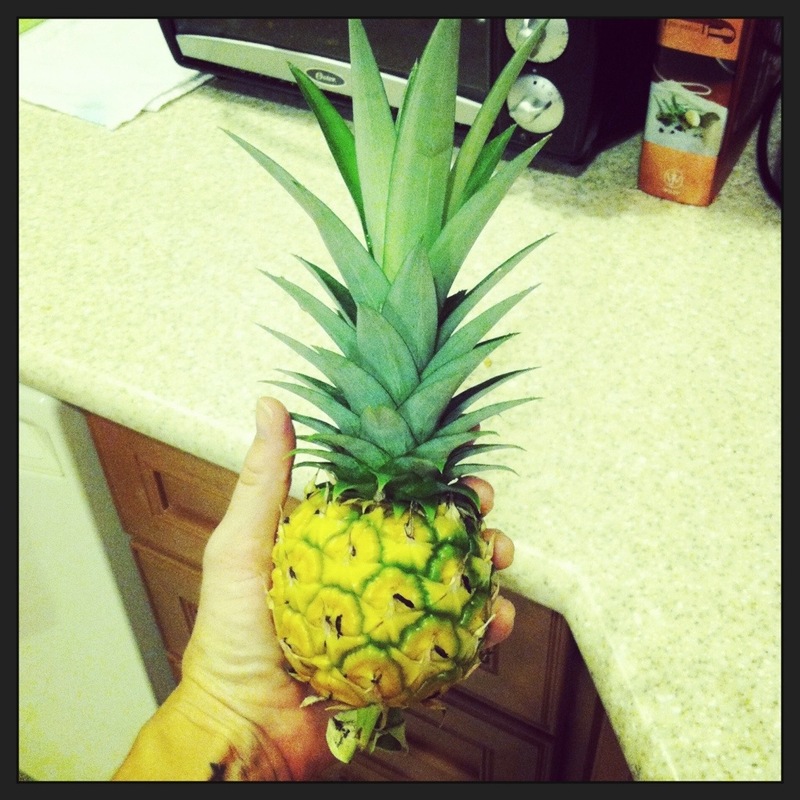 A long time ago, when I first started blogging, I had a Pineapple Project. A pineapple grew from a pineapple grew from a pineapple plant I had planted and I documented the process. That first pineapple was 4 years ago. That same plant grew another fruit the following year. The original plant died off, leaving a pup plant, which is what pineapple plants do. That pup finally bore fruit this year. Usually, pineapples start growing in the summer and are ready to eat by December or so… or, at least, my last two pineapples followed that timeline. This guy started growing in the winter (which was very warm) and was ripe by summer. The cold snap we had in the middle of that is probably what made him a munchkin pineapple. He was seriously tiny, but oh-so-sweet and tasty. 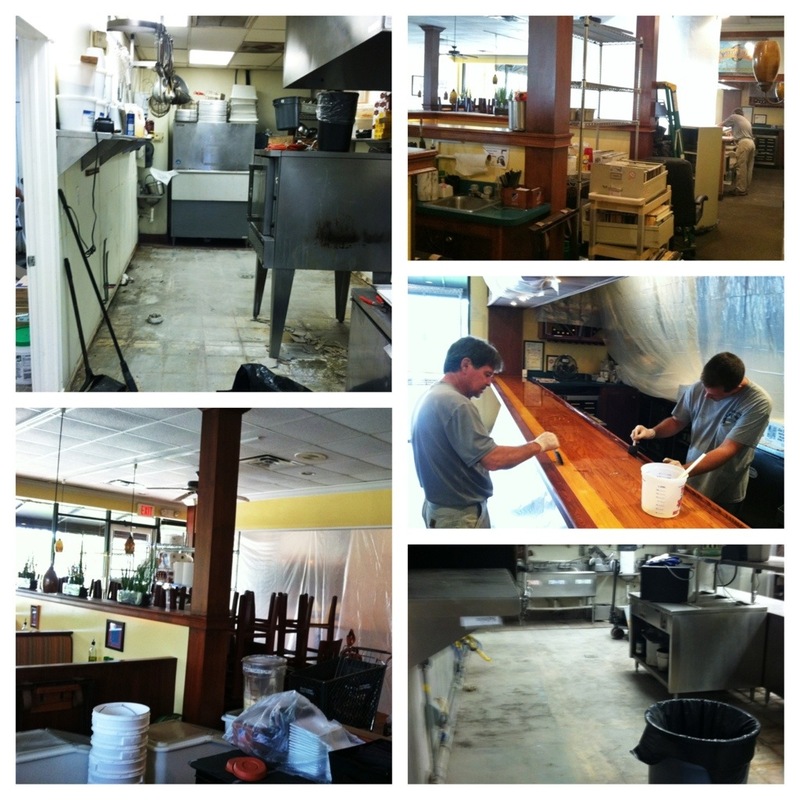 We closed for three days at work to do some remodeling and maintenance work. In three days we managed to empty the kitchen of nearly all of the equipment, re-tile the kitchen, office & dry storage areas, re-pave the parking lot, sand down and re-epoxy the bar top, paint several inside doors, paint some furniture, paint the outdoor patio floor, paint the walls in dry storage and deep clean all of the equipment and pretty much the entire inside of the restaurant. And, proudly, the only thing that we didn’t do ourselves was the kitchen floor & the parking lot. I wore a face mask for three days, but it was totally worth it to see the outcome. Also, it was amazing how many customers walked across the blocked off and freshly tarred parking lot to see if we were closed. We went on a mini-vacation with my parents to Steinhatchee. Steinhatchee is a really small town on a rive that leads out to the Gulf in the armpit of Florida. I don’t mean it’s smelly… it’s just in the curve of Florida before the panhandle. The scalloping there in the summer is awesome… you snorkel on the grass flats and pick up the most delicious little bay scallops. 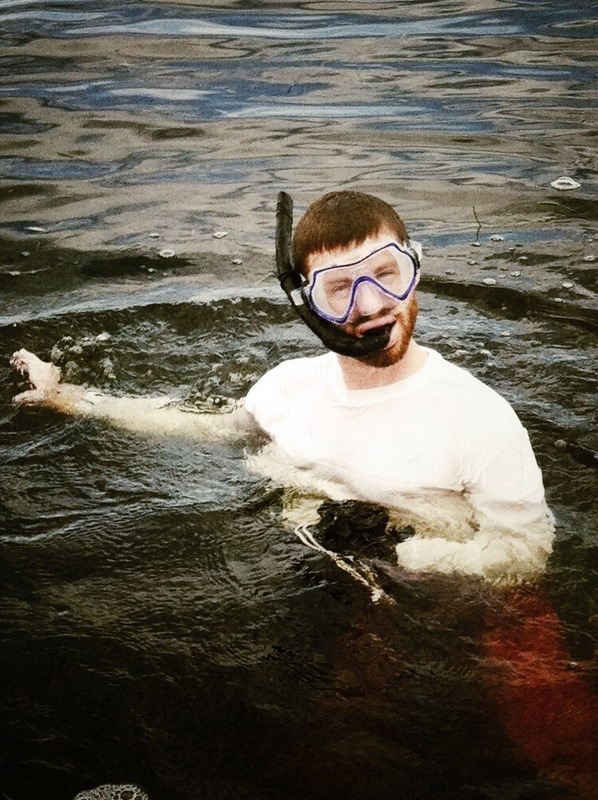 We had a great long weekend, but it rained a lot so there wasn’t actually a lot of scalloping to be done. 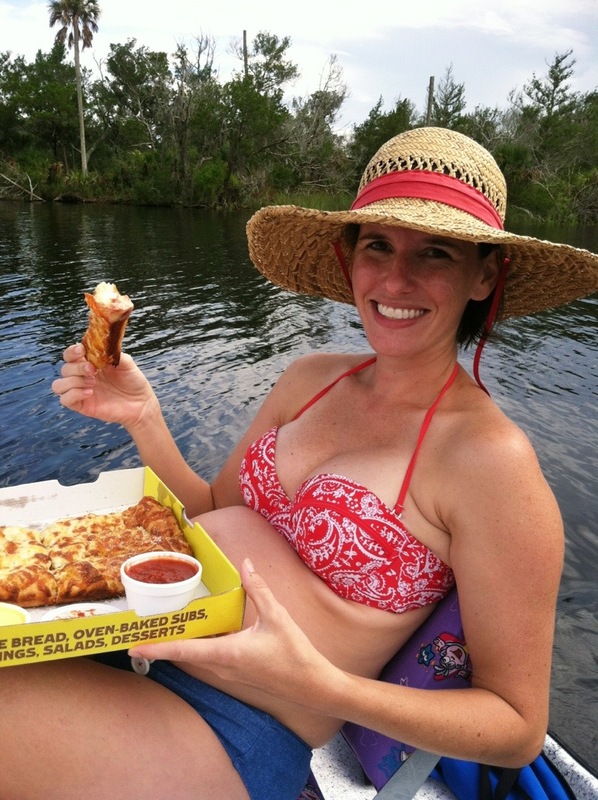 There is definitely a Hungry Howie’s on the river. You can call in your order when you are done fishing or scalloping or whatever and then go pick it up by boat. This made a pregnant lady very happy. This is how Bug spends his time in the boat. Catching, naming, playing with and then releasing bait fish and shrimp. 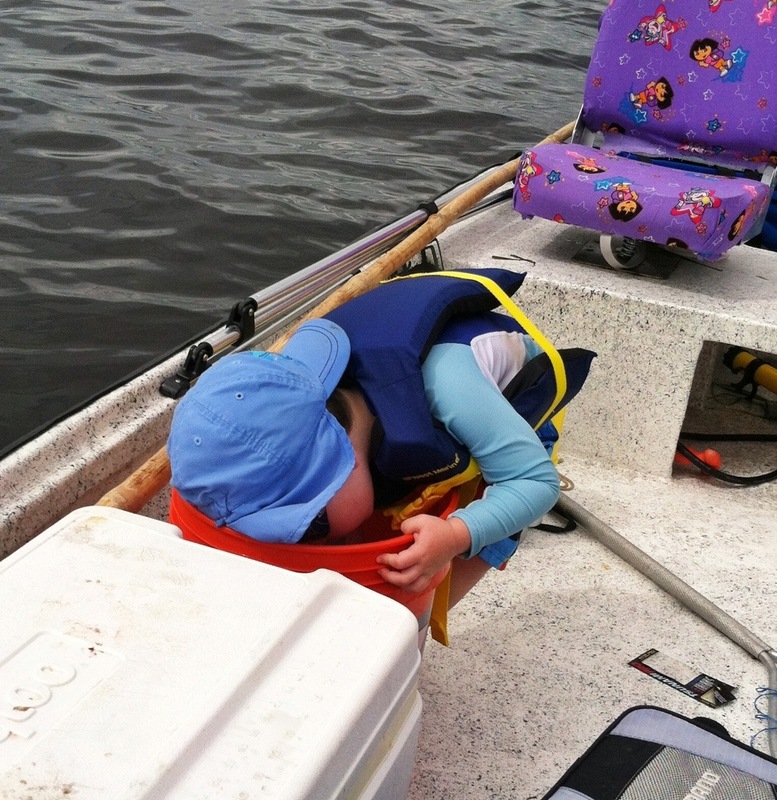 It is amazing how quickly those little hands can grab a pin fish. While swimming at the beach house, Bug turned Aunt Millie in to an elephant. He’s quite the magician. After swimming at the beach house, Bug & I went for $0.99 ice cream at our favorite farm market, Detwiler’s. 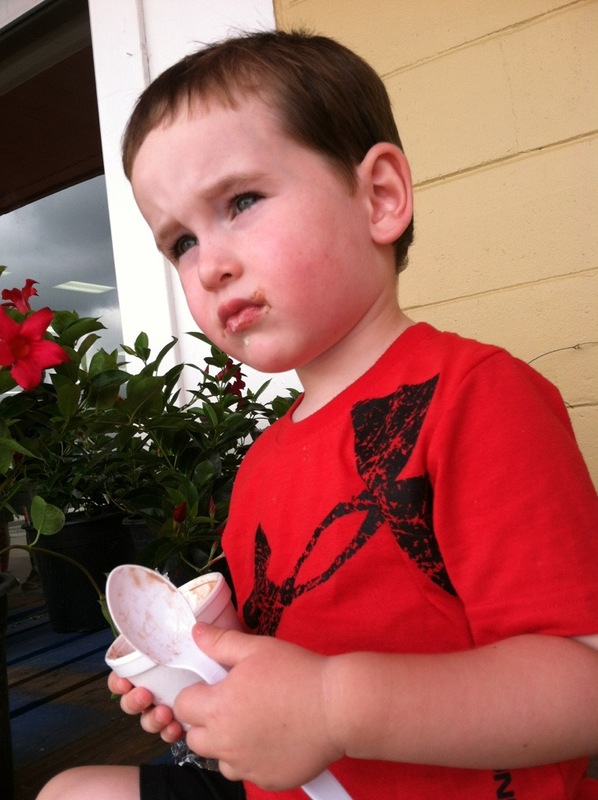 Kid takes his ice cream seriously. Click to subscribe and receive new posts by email. Promise I won't share your email with any scary people.